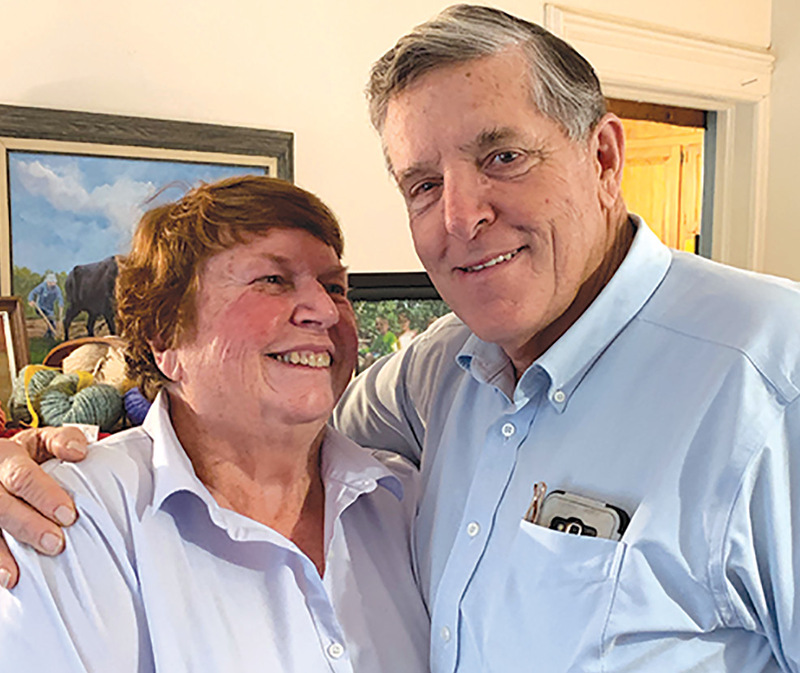 Carol and Harrison Griffin, the Observer’s Valentine Couple this year, are pictured at home during their interview. Carol and Harrison Griffin were high school sweethearts who will soon be celebrating their 50th anniversary! Carol grew up on a farm here in Suffield, Harrison grew up on a farm in East Granby, and they met in high school when they both were in 4-H. Harrison’s Polish family farm dated from 1647 (the farm has been recognized as having been in the same family since the birth of the Constitution), and Carol’s family came from Ireland in the late 1800s. They dated and then graduated from Suffield High School (since East Granby didn’t have a high school at that time) when the high school was what is now McAlister Intermediate School. Both Harrison and Carol went on to college at the Hartford Branch of UConn. Harrison graduated with a degree in Dairy Management, and Carol (the first of her siblings to go to college) graduated with a degree in English Education. After college, Harrison had a chance to be part of the International Farm Youth Exchange, and in 1966, he went to New Zealand for seven months to learn. He wrote lots of letters home to Carol. Phoning from New Zealand was expensive, so the letters helped to span the divide and keep them connected. Carol still has Harrison’s letters! After his trip to New Zealand, Harrison came home to work the family farm. In 1967, he was asked by the Suffield School District to consider being a teacher for the new vo-ag program. He wasn’t so sure that was anything that would interest him, but he soon found out he enjoyed teaching and could continue to help with the family farm. He taught in Suffield and later Rockville, but in 1981, Harrison was hired to be the director of the Vo-Ag program at Suffield High School. He remained the director until 2009. Teaching was exciting, and he loved dealing with young people and teaching the skills they would need to be successful. In 2017, Harrison won The National Association of Agricultural Educators Award, and the whole family went to Nashville to see him accept it. After college, Carol worked in Windsor Locks as a middle school English teacher, later getting her Masters in Secondary Reading. Once their first child, Jonathan, came along, Carol wanted to be a stay-at-home mom. Eventually, she would become a tutor and spent 16 years working with kids, one of the things she loved. Carol and Harrison were married in 1969, and because they were both from farm families, they had to pick a date “between corn and hay.” Apparently, Harrison almost missed the wedding because it was baling season and he was out in the fields losing track of time. They went on a honeymoon to Europe and England, on the “Europe on $5-a-day plan.” It was a wonderful and varied trip. For years, Carol and Harrison hosted international 4-H students each summer from many counties. The young people would come to stay and learn about farming and American culture. The Griffins are still in contact with many of the students. Carol and Harrison have three children, Jonathan, Sherry and Sarah-Jean. All the siblings are connected in some way to agriculture. Their children run Oxen Hill Farm, a Community Supported Agriculture on Hill Street, where you can join to get fresh organic vegetables from spring through fall each year as well as flowers. Now retired, Carol and Harrison love being involved with their children and six grandchildren. They enjoy going to auctions and wish for more time to travel and to collect antiques. Carol enjoys drawing and painting and dabbles in wool from her ten sheep. Harrison started Griffin Farm Equipment, which deals in equipment for hemp growers. There is a real sense of welcoming and good humor at the Griffin home. “We grew up poor, but we never realized it, because we were having too much fun.” Carol believes that they are blessed with a love of family, an understanding of sacrifice, and a push for learning, which she credits their parents with teaching them.